10" Running 6 8 10"
4" Swimming 2 2 4"
V. Leap (7") 12 1/2"
Brace 0 +2 1/2 +2 vs. Range Mod. Mr. Incredible is one of the greatest of the great wave of superheroes, widely acclaimed in his time. Unfortunately, he is also the hero best remembered, perhaps, for triggering the avalanche of lawsuits that put supers out of business for a decade and a half. 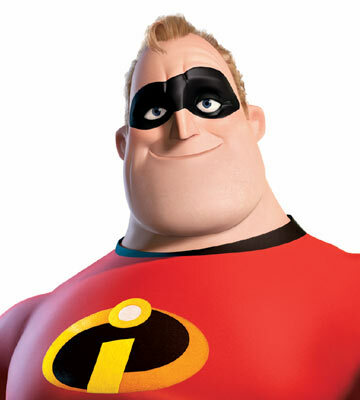 He married Elasti-girl and not-so-willingly went into retirement until recent events brought out the Incredibles. Mr. Incredible is a bit of a show-off but very sincere in his commitment to help the innocent/victimized. He is an adrenalin junkie as well, and can't settle down easily to the mundane life. "We're superheroes, what can happen?" Not your average brick, Mr. Incredible is wily in combat, resorting to unpredictable tactics and working well with teammates. While his incredible strength is his primary ability, his tactical sense cannot be under-rated, and he's capable in stealth mode as well as open combat.